Understanding superconductivity whereby certain materials can conduct electricity without any loss of energy has proved to be one of the most persistent problems in modern physics. Scientists have struggled for decades to develop a cohesive theory of superconductivity, largely spurred by the game-changing prospect of creating a superconductor that works at room temperature, but it has proved to be a tremendous tangle of complex physics. Now scientists at the U.S. Department of Energy's Lawrence Berkeley National Laboratory (Berkeley Lab) have teased out another important tangle from this giant ball of string, bringing us a significant step closer to understanding how high- temperature superconductors work their magic. Working with a model compound, the team illuminated the origins of the so-called "stripe phase" in which electrons become concentrated in stripes throughout a material, and which appears to be linked to superconductivity. "We're trying to understand nanoscale order and how that determines material properties such as superconductivity," said Robert Kaindl, a physicist in Berkeley Lab's Materials Sciences Division. "Using ultrafast optical techniques, we are able to observe how charge stripes start to form on a time scale of hundreds of femtoseconds." A femtosecond is just one millionth of one billionth of a second. Electrons in a solid material interact extremely quickly and on very short length scales, so to observe their behavior researchers have built extraordinarily powerful "microscopes" that zoom into fast events using short flashes of laser light. Kaindl and his team brought to bear the power of their ultrafast-optics expertise to understand the stripe phase in strontium-doped lanthanum nickelate (LSNO), a close cousin of high-temperature superconducting materials. "We chose to work with LSNO because it has essential similarities to the cuprates (an important class of high-temperature superconductors), but its lack of superconductivity lets us focus on understanding just the stripe phase," said Giacomo Coslovich, a postdoctoral researcher at Berkeley Lab working with Kaindl. "With science, you have to simplify your problems," Coslovich continued. "If you try to solve them all at once with their complicated interplay, you will never understand what's going on." 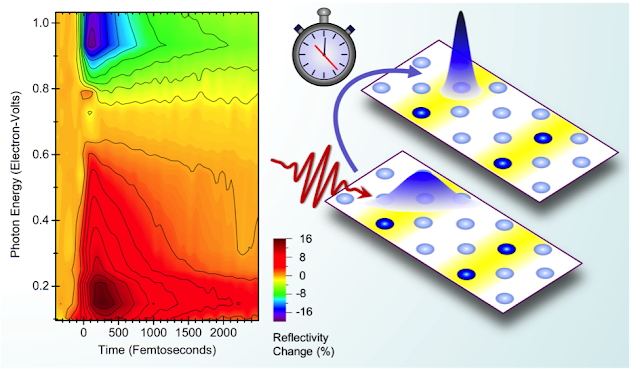 Kaindl and Coslovich are corresponding authors on a paper reporting these results in Nature Communications, titled, "Ultrafast charge localization in a stripe-phase nickelate." Coauthoring the paper are Bernhard Huber, Yi Zhu, Yi-De Chuang, Zahid Hussain, Hans Bechtel, Michael Martin and Robert Schoenlein of Berkeley Lab, along with Wei-Sheng Lee, and Zhi-Xun Shen of SLAC National Accelerator Laboratory, and Takao Sasagawa of Tokyo Institute of Technology. Stripes are seen in all high-temperature superconductors near the superconducting transition temperature. In this LSNO crystal stripes form only at cryogenic temperatures of about 168 degrees Celsius (approximately 271 °F), yet at far higher temperatures the team hit upon large changes of the material's infrared reflectivity. These invisible "color" changes represent an energy threshold for electrical currents, dubbed the energetic "pseudogap", which grows as the crystal cools – revealing a progressive localization of charges around the nickel atoms. The scientists then examined the dynamics of LSNO in "pump-probe" experiments, where they melted stripes with an initial ultrafast pulse of laser light and measured the optical changes with a second, delayed pulse. This allowed them to map out the early steps of charge ordering, exposing surprisingly fast localization dynamics preceding the development of organized stripe patterns. A final twist came when they probed the vibrations between nickel and oxygen atoms, uncovering a remarkably strong coupling to the localized electrons with synchronous dynamics. Beyond the ultrafast measurements, the team also studied X-ray scattering and the infrared reflectance of the material at the neighboring Advanced Light Source, to develop a thorough, cohesive understanding of the stripe phase and why it forms. Said Kaindl, "We took advantage of our fortunate location in the national lab environment, where we have both these ultrafast techniques and the Advanced Light Source. This collaborative effort made this work possible." Having illuminated the origins of the stripe phase in LSNO, the researchers expect their results to provide new impetus to understanding the "pseudogap" in other correlated oxides especially in high-temperature superconductors where fluctuating stripes occur while their role for the superconductivity mechanism remains unclear.